PCUSA BDS: What to do? Whenever some story emerges having to do with PCUSA’s obsession with Israel, with the relentless drive to get divestment back on organization’s agenda (no matter how many times it’s rejected), with attempts to denigrate and even demonize the Jewish state, its inhabitants and supporters, all roads seem to lead to the Israel-Palestine Mission Network (IPMN). We saw this most recently when the organization decided the most important way to promote their (real) agenda was to drop all pretenses of peace-making and instead invest their time and resources into creating “Zionism Unsettled,” a “study document” designed to educate the flock regarding Zionism as the font of all evil (making it clear that the sooner an entity built on such a hateful ideology ceases to be, the better). In case you think I’m reading too much into this one document, read this article published by Noushin Framke, a major player in IPMN, in which she makes it clear that support for a two-state solution (the official policy of PCUSA, by the way) is not on the agenda of a church organ (the IPMN) allegedly created to support PCUSA’s peacemaking goals. In it, she advocates for (you guessed it) a “One State Solution,” and unlike other One Staters who try to hide their ultimate goals, Framke seems to have no problem with the fact that such a “solution” will unquestionably mean the termination of a Jewish homeland (a point taken up in more detail here). The excess of Zionism Unsettled should also not be seen as an aberration for IPMN, a group with a history and culture of excess that has driven them to embrace classical Jew hating motifs and contemporary Jew haters, and then strike a pose as victim when their outrageous behavior is made public. As most of you now, I’m not a big fan of guilt by association when it comes to what appears in social media. 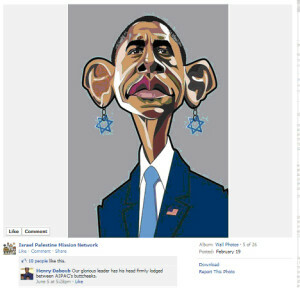 But apparently, the reason this cartoon was posted and stayed on the IPMN page for such a long time is that it fit perfectly well with a host of anti-Semitic graffiti and links to articles by people even the BDS movement has deemed beyond the pale. In fact, it was only when both Jewish and Presbyterian organizations went public with complaints about the kind of of sewerage IPMN traffics in that the group took action by (1) deleting its Facebook page entirely and (2) declaring that pointing out IPMN’s patience with Khazar and 9/11 Conspiracy Theorists was part of a wider conspiracy to silence them. In other words, Zionism Unsettled is not an aberration, but rather represents the beliefs and goals of those relentlessly pushing divestment within the church. For once you look past the language of “peace” and “justice” that serves as their gossamer apparel, the IPMN emperor is revealed in all its naked fanaticism, which explains why outcries from individual Jews and Jewish organizations, complaints about the damage the organization is causing to interfaith relations, and appeals to stop (best exemplified by five votes against divestment in ten years) all fall on deaf ears. For gripped as they are in a fantasy ideology where they and they alone represent the true and the just, IPMN must treat everyone else (including the Presbyterian Church which has chartered them) as mere means to IPMN’s own ends. Now it would be one thing if IPMN was some independent organization outside of PCUSA hoping to sway church policy (similar to the anti-divestment group Presbyterians for Middle East Peace). But apparently their role as a “Mission Network” gives IPMN a special relationship in which donations to the group flows through the church, their material is distributed to churches across the nation, church leaders meet with them on a regular basis, and (as far as I can tell) the organization’s agenda sets the limits of what can and cannot be said within the wider PCUSA organization. A story I keep coming back to occurred in 2008 when it briefly looked as through the church was ready to at least acknowledge it had a Jewish/Israel problem by publishing a document entitled “Vigilance Against Anti-Jewish Ideas and Bias,” a remarkable confession that finally acknowledged the dark side of church policy vis-à-vis Israel and the Middle East. But no sooner had that document been published (and praised by Jews and Presbyterians who had been urging such honesty for years) than it was quietly replaced with a “revised” version entitled “Vigilance against Anti-Jewish Bias in the Pursuit of Israeli-Palestinian Peace” that swapped earlier confessional language with the usual BDS boilerplate. Since no one has ever fessed up to who was behind this switcheroo, I can only speculate on the role IPMN played in such debased behavior on the part of the church. But given that this represented one more incident in which PCUSA had to humiliate itself to conform to BDS orthodoxy, is there any doubt that the BDS mindset that defines IPMN, a mindset that demands all branches of an infected organization bend to the BDSers will, was the driving force behind this incident? Whenever it is confronted by the latest IPMN outrage (most recently “Zionism Unsettled”), PCUSA leaders describe the organization as “speaking to the church, rather than for it,” a strange characterization given that – with divestment back on the PCUSA agenda regardless of how many times members vote it down – IPMN seems to have far more sway over church policy than do its nominal leaders and governing institutions. I think it was the combined efforts of the IPMN, the National Middle Eastern Caucus, and specific Presbyterian employees – e.g. mission co-workers – that resulted in the PC(USA) pulling “Vigilance Against anti-Jewish Bias”. The original release of that document did show one encouraging thing – though I’m not sure that remains the case: at the time, there were people working within the national organization who were legitimately concerned about Presbyterian antisemitism. Fascinating. Thanks for researching this.